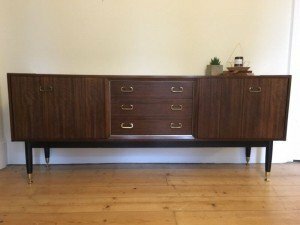 A vintage G plan Tola sideboard on brass feet, having two large cupboards aside three central drawers. 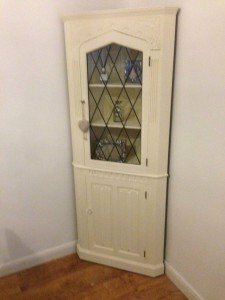 A tall standing solid wood corner display cabinet, hand painted in white in the shabby chic style. 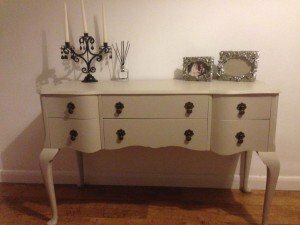 A white solid wood shabby chic vanity dresser, having six drawers with cast iron knobs, together with two silver photo frames and a black candelabra. 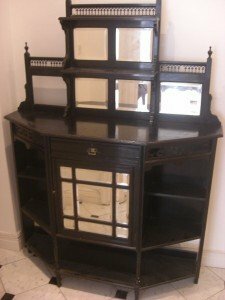 A tall standing solid wood vintage dresser, having two glass inlaid doors opening to reveal three shelves, two brass handled drawers above a double cupboard. 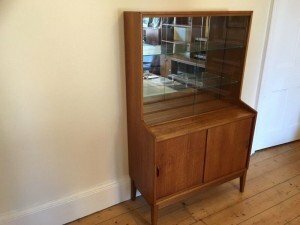 A vintage teak mirrored back sideboard, having two glass sliding doors opening to reveal two glass shelves, above a double sliding door cupboard. 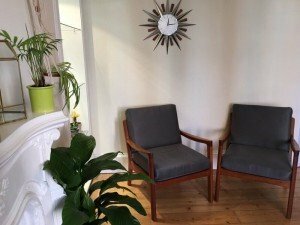 A pair of vintage low back teakwood armchairs, upholstered to the seat and backrest in a grey wool blended fabric. 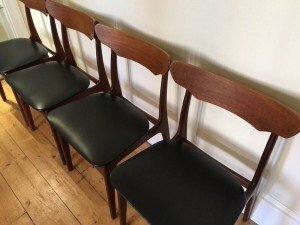 A set of four mid-century low back Danish dining chairs, upholstered to the seat in black leather. 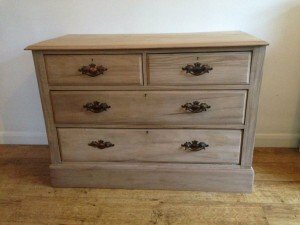 A solid pine shabby chic chest of key locking drawers, having two small drawers above two large drawers. 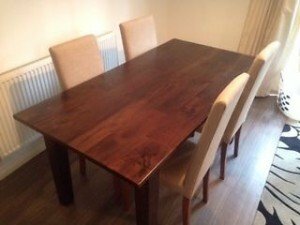 A solid wood large rectangular dining table, together with four matching high back dining chairs, upholstered in cream faux leather. 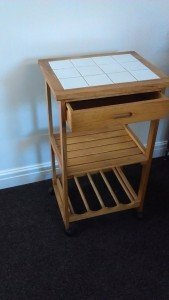 A solid pine tall standing butcher block, having white tiles to the top above a small drawers, a shelf and a wine rack. 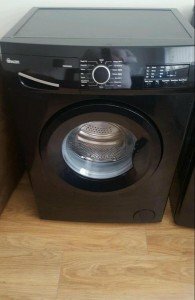 A black Swan under counter large capacity washing machine. 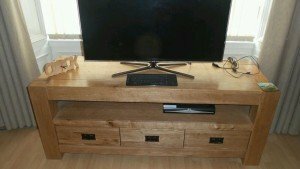 A 32 inch black Samsung flat screen television, together with a solid wood television unit with three drawers. 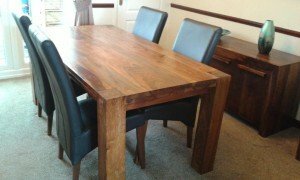 A solid wood rectangular dining table, together with four matching high back dining chairs, upholstered in black leather. 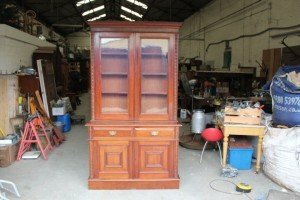 A vintage mahogany mirror backed hall dresser, having a small drawer above a mirror fronted cupboard. 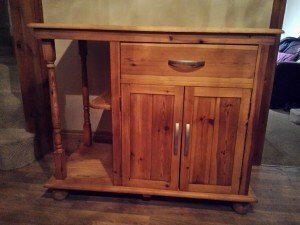 A large pine sideboard on ball feet, having a small steel handled drawer above a double cupboard. 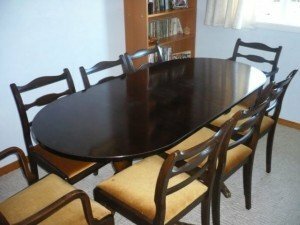 A large vintage mahogany extendable oval dining table, together with eight matching low back dining chairs, upholstered to the seats in yellow velour. 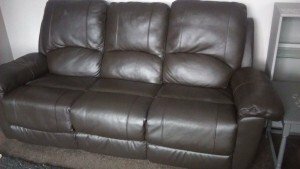 A three seater high back reclining sofa, upholstered in black faux leather. 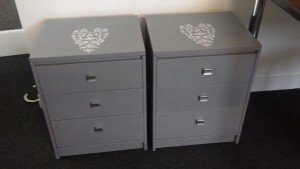 A pair of bedside chests of drawers, hand painted in grey white a white heart mural to the top. 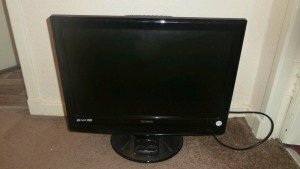 A Technical 22 inch black flat screen television, with a built in dvd player and iPod dock. 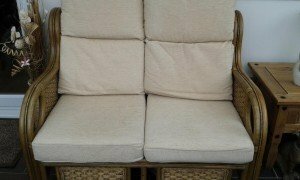 A two seater high back rattan conservatory sofa, upholstered to the seat and backrest in cotton.